As we were enjoying a mushroom and asparagus frittata for dinner the other night, I found myself thinking: “this is so delicious…I should put it on my blog.” This thought was immediately followed by the thought that I had probably posted way too many frittatas over the years and so I probably didn’t need to post this one too. But then I looked at the recipe index and discovered that on balance, I really hadn’t posted that many frittatas. It just happens that we eat them a lot (I love them)…so I figured that I must have posted a bunch. 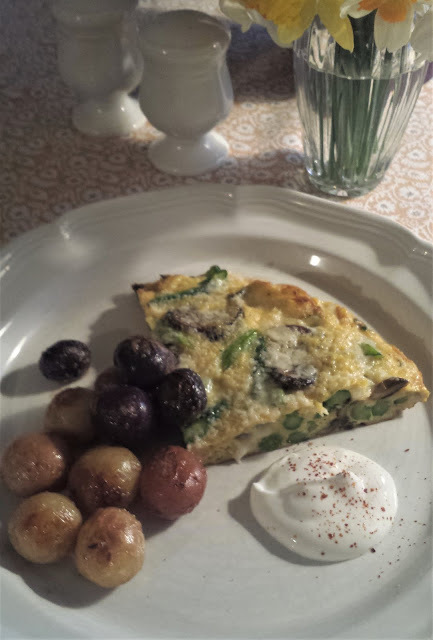 And since I haven’t… And since this one is just perfect for spring… I decided to share it after all…along with a few thoughts on my basic frittata method. The method for this one is the same that I always employ. I cook my filling ingredients—in this case sautéed mushrooms and blanched asparagus—fold them into some beaten eggs, pour the whole thing into an oiled and very hot non-stick sauté pan, cook over moderately high heat while simultaneously shaking and stirring the contents of the pan, let it sit for a minute or two over low heat to sort of solidify and firm up…and then finish it under the broiler (to give it a bit of puff and a nice golden brown surface). The whole operation from the time the eggs hit the pan to the time you pull it out from under the broiler takes less than five minutes. I wouldn’t be surprised though to learn that this is not how you make frittatas. It seems to be an unusual method. I have only seen it described in two cookbooks: Michael Chiarello’s Casual Cooking and The Union Square Café Cookbook by Danny Meyer and Michael Romano. I have been thinking about all of this because I will be teaching this frittata in a class this week. I always teach this rather fast and furious method, but it has occurred to me that the other, more usual, method (pouring the eggs over the filling ingredients in a moderately hot non-stick pan and then transferring it to the oven where it cooks for 10 minutes or longer) might be a better place for the frittata novice to begin. You have to be confident and move with speed and purpose if you are going to make it with the method I describe above. The slower, baked method seems a little less intimidating. So in preparation for this class, I made this frittata both ways (and have included instructions for both in the recipe). The good news is that it is delicious using either method. But I have to say that in my opinion the fast method produces a lighter and more tender final result. This may be just me. I have a chef friend who uses the baked method—and her frittatas are always tender and delicious. You should of course use the method you prefer…but if you have never tried the quick method, you should give it a try at least once. Maybe even do your own test—making the same one using both different methods so you can compare and contrast. If you are new to frittatas this one would be a great one with which to begin. It is simple…with not too many ingredients. If you know how to sauté mushrooms and blanch green vegetables, you are most of the way there. 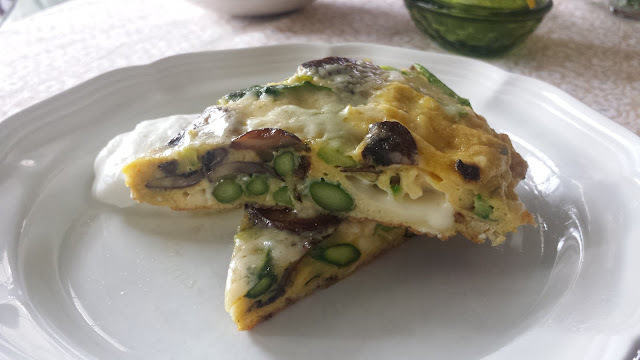 I happen to love the combination of eggs with asparagus and mushrooms, but this frittata will work with pretty much any cooked green vegetable. It is in fact a great way to celebrate and enjoy all of the lovely spring vegetables that will be appearing soon at your farmers’ markets…not to mention the new spring onions and beautiful local eggs that will be right there with them. Since the parade of spring vegetables is just getting started, there will be many opportunities to hone your frittata making skills…and choose the method you prefer…during the weeks to come. This frittata is a template for any mushroom and spring, green vegetable frittata. Feel free to substitute blanched peas and fava beans, diced/sliced cooked zucchini, or turned, cooked (poached, braised or roasted) and sliced or diced artichoke bottoms for the asparagus…or use a mixture of two or more. Aim for 1 1/2 to 2 cups cooked green vegetables. Bring a pan of salted water to the boil. Add the asparagus and cook until tender—about 2 to 4 minutes. (It is better for a frittata to slightly over cook the vegetables rather than to undercook them.) Scoop out the asparagus and spread on paper or kitchen towels to cool. Heat a non-stick sauté pan over medium high to high heat. Add a tablespoon or so of the oil. When the pan is hot, add the mushrooms and sauté until tender and caramelized. Reduce the heat slightly and add the butter. When the butter has melted, add the green onions to the pan along with a pinch of salt and cook until wilted and tender. Remove the pan from the heat and set aside until ready to make the frittata. When ready to prepare the frittata, return the pan of mushrooms to moderately high heat and add the asparagus. Heat the vegetables through while you preheat the broiler and heat the frittata pan. Place a 10-inch non-stick sauté pan (I prefer French steel pans) over moderately high heat. Break the eggs into a bowl and beat just to break them up. Season with salt (I find that about a half teaspoon of kosher salt is about right…but you should adjust to suit your taste) and pepper. Drizzle a small amount of oil over the hot vegetables and toss to combine. Fold the hot vegetables and the cubed cheese into the eggs. Add a tablespoon or so of oil to the skillet. When the skillet is hot (the oil should be almost smoking), carefully swirl the pan to make sure the oil is coating the bottom and part way up the sides of the pan. Add the egg mixture. The eggs should begin to set immediately. Shake the pan back and forth with one hand, while with the other you alternately stir in the center and lift at the edges (in order to let the uncooked egg run underneath those that have coagulated) using a heat-proof rubber spatula. Continue cooking—stirring, shaking and lifting—until the eggs are mostly cooked but still a bit liquid-y (there will be large curds of coagulated egg and some liquid eggs). This should only take a minute or two. Reduce the heat to very low and allow the frittata to sit without stirring for a minute or so. During this time, use your spatula to even up and sort of pat the eggs and vegetables into a nice even cake, running the spatula around the edge occasionally—dribbling in some more oil around the edges if the eggs appear to be dry and sliding the pan back and forth a couple of times to make sure the frittata isn't sticking. This final couple of minutes of stove top cooking will give the frittata the opportunity to set up into a solid cake. When the frittata is mostly set, place the skillet under the broiler and broil just until the surface is no longer moist—about 30 seconds. Sprinkle the cheese over the surface and broil until the cheese melts—another 30 seconds. 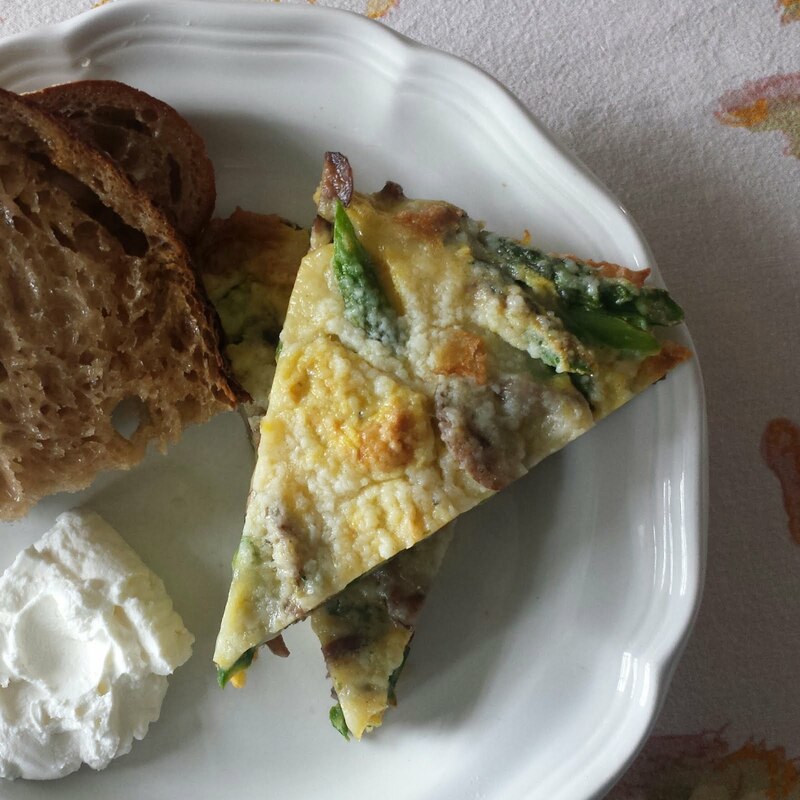 Slide the finished frittata onto a platter or cutting board and let sit for a minute or two. Cut into wedges and serve. The frittata may also be served at room temperature. Serves 4 as an entrée, or 8 as part of a buffet. This frittata is delicious with the addition of fresh herbs: minced parsley, picked thyme, chopped tarragon or finely sliced basil. Add the thyme with the scallions. Add the other herbs to the eggs with the vegetables. You may use any green spring vegetable along with—or instead of—the asparagus: blanched peas or fava beans, sautéed/roasted zucchini and poached/braised artichoke bottoms are all particularly nice. Aim for 1 1/2 to 2 cups total volume of cooked vegetable. If you like, add a 2 or 3 thin slices of prosciutto, cut in 1/4-inch strips. Add with the asparagus to the mushrooms when you are heating the vegetables through. Alternate, baked method: Heat the frittata pan over moderate heat, add the oil and then the cooked vegetables. Heat the vegetables through (on the stove top…or in the preheated oven). Pour in the beaten, seasoned eggs. Make sure the vegetables are evenly distributed. Scatter the cubed Fontina over all, giving the pan a small jiggle to help the cheese settle in. Transfer to a 400° oven and bake until the eggs are almost set…about 10 minutes. Scatter the parmesan or pecorino over the surface and run under the broiler until the cheese is melted and bubbling. Let the frittata set for a few minutes before slicing and serving. The asparagus in this recipe are peeled so they will cook more evenly and so the diner can easily cut through the frittata without running into the tougher bits of skin. If you have never peeled asparagus, check out my basics post.